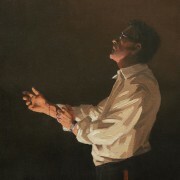 Happy Birthday today to Jack Vettriano We will be raising a glass or two to mark his 64th birthday in Jack’s Gallery, Henley-on-Thames this evening. 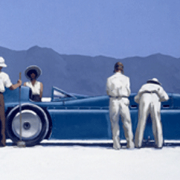 New stretched canvases of ‘Bluebird at Bonneville’ are now in stock. 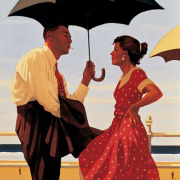 This vibrant image is part of the Summers Remembered Collection of 4 Limited Editions signed by Jack Vettriano. 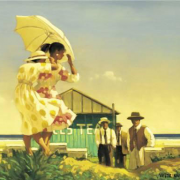 The sinister and dangerous attitude of the men watching the young girls out for a sunny outing on the beach dominates the seeming innocence of the girls.